Some cookies may be better suited for production on certain types of machines. If looking to produce more than cookies, certain equipment options might work better. Clearly identify and focus attention on the products that drive growth. The next consideration you need to keep in mind is your dough type. When its comes to dough, the following criteria can be important when transitioning to cookie production automation. Hard vs. Soft Dough – Do you have a hard dough similar to a traditional chocolate chip cookie, or do you have a soft dough or batter similar to meringue? Fat type – What type of fat are you using in your recipe – is it butter, margarine, oils? Fat content – Does your dough have a high fat content? Is it particularly sticky when handled? Particulates – Does your dough contain any added particulates? If so, what kind of particulates – nuts, chocolate chips, chunks, candy, etc? Also, what size are these particulates? What is the current shape of your product? What is the size/diameter of dough before it is baked? What is the size/diameter of dough after it is baked? Is there much spreading? Do you want to change your current product shape? If so, what shape do you want your product to be in? We can accommodate a wide range of shapes including round, square, bar or other geometric shapes. Does your product currently have any embossing or engraved design features that are visible when baked? We can also accommodate a wide range of emobssed or engraved designs. Understanding your current production process will help our team conduct your equipment demonstration in a similar manner that you would implement equipment in your facility. This includes current methodologies for mixing, forming, and baking. When purchasing cookie machines or any other bakery equipment we highly recommend that customers test equipment prior to committing to a purchase. Our team currently offers complimentary equipment demonstrations. This process helps ensure that your final purchase is a good fit for both your cookie type(s) and bakery. 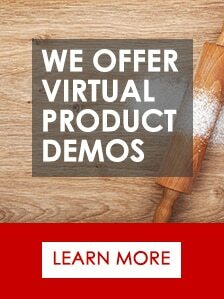 To learn more about our demonstration process please click here. Inclusions: When mechanizing production, your cookie dough will typically experience increased friction as dough passes through a combination of paddles, gears, dies, or drums. This friction may result in some slight degradation of your inclusions. For example, pieces of hard colored candy such as M&M’s may break within the dough and not be deposited whole. While this will not happen to every single inclusion, a way of solving this issue to also place some of these inclusions onto the deposited dough, achieving a more recognizable look when baked. Process: When initially mixed, sometimes dough can be a bit sticky. As a result the dough may need to be chilled prior to processing with equipment. This is just one example that may impact your current production process. Recipe: Sometimes your current recipe may need some slight modification in order for your dough to be processed with equipment. This may include adjusting fat content, ingredients, baking times, etc. Shape: Sometimes we encounter customers who have been producing their product via a scooping method. This shape is often difficult to achieve when transitioning to production automation. As an alternative, you can easily achieve a puck shape with adjustable thickness.  Erika Record Baking Equipment is the leading manufacturer and distributor of retail and commercial bakery equipment. For over 25 years, we have provided our customers with both excellent equipment and outstanding customer service. We are industry leaders in providing comprehensive cookie production solutions for doughs with or without particulates, short doughs, embossed designs, custom shapes and pet treats. 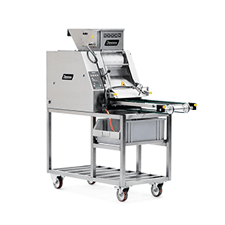 Our equipment lineup consists of bread and roll systems, condiment spreaders, confectionery depositors, divider/rounders, glazers and sprayers, make-up lines, mixers, ovens, reversible sheeters, slicers, and refurbished equipment. To view our entire lineup please click here. 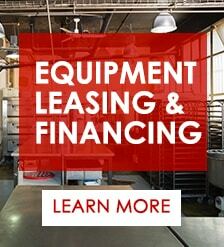 Erika Record Baking Equipment has a variety of equipment solutions that can help automate your cookie production. Deighton Manufacturing, produces the Formatic range which includes the Formatic R-Series, the Traymatic, and DD 12,000. 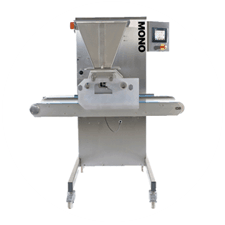 These machines are perfect for hard dough types (both with and without particulates) and feature removable drums that can be ordered in a variety of shapes and configurations. For more information, click here. Janssen produces the K-Series Rotary Cookie Machine. 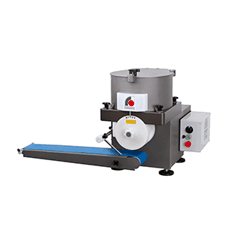 This machine facilitates production of rich, buttery cookie dough as well as short dough. This includes spekulatius, fine tea cookies and many specialty products such as printed, almond dough, lattice works, gingerbread dough, shaped cookies and endless dough sheets. For more information, please click here. These multi-purpose machines are perfect for producing cakes, cookies, pastries and more. The Epsilon (table top) and Omega Series confectionery depositors are capable of producing complex baked goods such as French Macarons, cupcakes, sheet cakes, petite fours, pâte à choux and much more. For more information please click here.